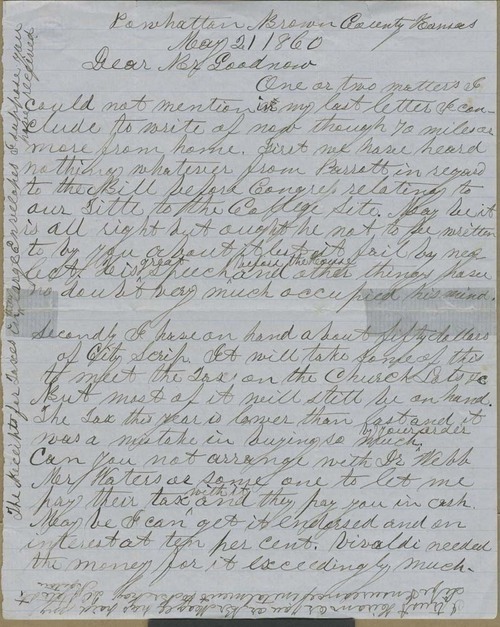 Joseph Denison wrote from Powhattan, Brown County, Kansas Territory, to Isaac Goodnow regarding issues of management of the church and college they had recently constructed. Denison had discovered that, due to the state of their treasury, some property must be sold in order to pay the taxes on the church lots. He also worried about the state of Bluemont College, as it had thus far attracted only 20 students.